For other places with the same name, see Qatar (disambiguation). Qatar (/ˈkætɑːr/, /ˈkɑːtɑːr/ ( listen), /ˈkɑːtər/ or /kəˈtɑːr/ ( listen); Arabic: قطر‎ Qaṭar [ˈqɑtˤɑr]; local vernacular pronunciation: [ˈɡɪtˤɑr]), officially the State of Qatar (Arabic: دولة قطر‎ Dawlat Qaṭar), is a country located in Western Asia, occupying the small Qatar Peninsula on the northeastern coast of the Arabian Peninsula. Whether the sovereign state should be regarded as a constitutional monarchy or an absolute monarchy is disputed. Its sole land border is with neighbouring Gulf Cooperation Council (GCC) monarchy Saudi Arabia to the south, with the rest of its territory surrounded by the Persian Gulf. An arm of the Persian Gulf separates Qatar from the nearby Bahrain. Location and extent of Qatar (dark green) on the Arabian Peninsula. In early 2017, Qatar's total population was 2.6 million: 313,000 Qatari citizens and 2.3 million expatriates. Islam is the official religion of Qatar. The country has the highest per capita income in the world. Qatar is classified by the UN as a country of very high human development and is widely regarded as the most advanced Arab state for human development. Qatar is a high-income economy, backed by the world's third-largest natural gas reserves and oil reserves. Qatar has been ruled by the House of Thani since Mohammed bin Thani signed a treaty with the British in 1868 that recognised its separate status. Following Ottoman rule, Qatar became a British protectorate in the early 20th century until gaining independence in 1971. In 2003, the constitution was overwhelmingly approved in a referendum, with almost 98% in favour. In the 21st century, Qatar emerged as a significant power in the Arab world both through its globally expanding media group, Al Jazeera Media Network, and reportedly supporting several rebel groups financially during the Arab Spring. For its size, Qatar wields disproportionate influence in the world, and has been identified as a middle power. Qatar is currently the subject of a diplomatic and economic embargo by Saudi Arabia, the United Arab Emirates (UAE), Bahrain, and Egypt, which began in June 2017. Saudi Arabia has also proposed the construction of the Salwa Canal, which would run along the Saudi-Qatar border, effectively turning Qatar into an island. Pliny the Elder, a Roman writer, documented the earliest account pertaining to the inhabitants of the peninsula around the mid-first century AD, referring to them as the Catharrei, a designation which may have derived from the name of a prominent local settlement. A century later, Ptolemy produced the first known map to depict the peninsula, referring to it as Catara. The map also referenced a town named "Cadara" to the east of the peninsula. The term 'Catara' (inhabitants, Cataraei) was exclusively used until the 18th century, after which 'Katara' emerged as the most commonly recognised spelling. Eventually, after several variations - 'Katr', 'Kattar' and 'Guttur' - the modern derivative Qatar was adopted as the country's name. In Standard Arabic, the name is pronounced [ˈqɑtˤɑr], while in the local dialect it is [ˈɡitˤar]. Human habitation of Qatar dates back to 50,000 years ago. Settlements and tools dating back to the Stone Age have been unearthed in the peninsula. Mesopotamian artifacts originating from the Ubaid period (c. 6500–3800 BC) have been discovered in abandoned coastal settlements. Al Da'asa, a settlement located on the western coast of Qatar, is the most important Ubaid site in the country and is believed to have accommodated a small seasonal encampment. Kassite Babylonian material dating back to the second millennium BC found in Al Khor Islands attests to trade relations between the inhabitants of Qatar and the Kassites in modern-day Bahrain. Among the findings were 3,000,000 crushed snail shells and Kassite potsherds. It has been suggested that Qatar is the earliest known site of shellfish dye production, owing to a Kassite purple dye industry which existed on the coast. In 224 AD, the Sasanian Empire gained control over the territories surrounding the Persian Gulf. Qatar played a role in the commercial activity of the Sasanids, contributing at least two commodities: precious pearls and purple dye. Under the Sasanid reign, many of the inhabitants in Eastern Arabia were introduced to Christianity following the eastward dispersal of the religion by Mesopotamian Christians. Monasteries were constructed and further settlements were founded during this era. During the latter part of the Christian era, Qatar comprised a region known as 'Beth Qatraye' (Syriac for "house of the Qataris"). The region was not limited to Qatar; it also included Bahrain, Tarout Island, Al-Khatt, and Al-Hasa. In 628, Muhammad sent a Muslim envoy to a ruler in Eastern Arabia named Munzir ibn Sawa Al Tamimi and requested that he and his subjects accept Islam. Munzir obliged his request, and accordingly, most of the Arab tribes in the region converted to Islam. After the adoption of Islam, the Arabs[which?] led the Muslim conquest of Persia which resulted in the fall of the Sasanian Empire. Abbasid Caliphate at its greatest extent, c. 850. Qatar was described as a famous horse and camel breeding centre during the Umayyad period. In the 8th century, it started benefiting from its commercially strategic position in the Persian Gulf and went on to become a centre of pearl trading. Substantial development in the pearling industry around the Qatari Peninsula occurred during the Abbasid era. Ships voyaging from Basra to India and China would make stops in Qatar's ports during this period. Chinese porcelain, West African coins and artefacts from Thailand have been discovered in Qatar. Archaeological remains from the 9th century suggest that Qatar's inhabitants used greater wealth to construct higher quality homes and public buildings. Over 100 stone-built houses, two mosques, and an Abbasid fort were constructed in Murwab during this period. However, when the caliphate's prosperity declined in Iraq, so too did it in Qatar. Qatar is mentioned in 13th-century Muslim scholar Yaqut al-Hamawi's book, Mu'jam Al-Buldan, which alludes to the Qataris' fine striped woven cloaks and their skills in improvement and finishing of spears. Much of Eastern Arabia was controlled by the Usfurids in 1253, but control of the region was seized by the prince of Ormus in 1320. Qatar's pearls provided the kingdom with one of its main sources of income. In 1515, Manuel I of Portugal vassalised the Kingdom of Ormus. Portugal went on to seize a significant portion of Eastern Arabia in 1521. In 1550, the inhabitants of Al-Hasa voluntarily submitted to the rule of the Ottomans, preferring them to the Portuguese. Having retained a negligible military presence in the area, the Ottomans were expelled by the Bani Khalid tribe in 1670. 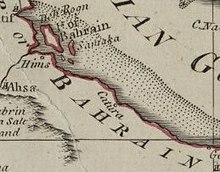 A 1794 map depicting Catura under the jurisdiction of Bahrain. In 1766, the Utub tribe of Al Khalifa migrated from Kuwait to Zubarah in Qatar. By the time of their arrival, the Bani Khalid exercised weak authority over the peninsula, not withholding that the largest village was ruled by a distant kin of the Bani Khalid. In 1783, Qatar-based Bani Utbah clans and allied Arab tribes invaded and annexed Bahrain from the Persians. The Al Khalifa imposed their authority over Bahrain and extended their area of jurisdiction to Qatar. A partially restored section of the ruined town of Zubarah. Following the swearing in of Saud ibn Abd al-Aziz as crown prince of the Wahhabi in 1788, he moved to expand his empire eastward towards the Persian Gulf and Qatar. After defeating the Bani Khalid in 1795, the Wahhabi were attacked on two fronts. The Ottomans and Egyptians assaulted the western front, while the Al Khalifa in Bahrain and the Omanis launched an attack against the eastern front. Upon being made aware of advancements by the Egyptians on the western frontier in 1811, the Wahhabi amir reduced his garrisons in Bahrain and Zubarah in order to re-position his troops. Said bin Sultan of Muscat capitalised on this opportunity and raided the Wahhabi garrisons on the eastern coast, setting fire to the fort in Zubarah. The Al Khalifa were effectively returned to power thereafter. As punishment for piracy, an East India Company vessel bombarded Doha in 1821, destroying the town and forcing hundreds of residents to flee. In 1825, the House of Thani was established with Sheikh Mohammed bin Thani as the first leader. Although Qatar had the legal status of a dependency, there was a popular sentiment of resentment against the Al Khalifa. In 1867, the Al Khalifa, along with the ruler of Abu Dhabi, sent a massive naval force to Al Wakrah in an effort to crush the Qatari rebels. This resulted in the maritime Qatari–Bahraini War of 1867–1868, in which Bahraini and Abu Dhabi forces sacked and looted Doha and Al Wakrah. However, the Bahraini hostilities were in violation of the 1820 Anglo-Bahraini Treaty. The joint incursion, in addition to the Qatari counterattack, prompted British political agent Lewis Pelly to impose a settlement in 1868. His mission to Bahrain and Qatar and the resulting peace treaty were milestones because they implicitly recognised the distinctness of Qatar from Bahrain and explicitly acknowledged the position of Mohammed bin Thani. In addition to censuring Bahrain for its breach of agreement, the British protectorate asked to negotiate with a representative from Qatar, a role which Mohammed bin Thani was selected to fulfil. The results of the negotiations left the nation with a new-found sense of political identity, although it did not gain an official standing as a protectorate until 1916. Under military and political pressure from the governor of the Ottoman Vilayet of Baghdad, Midhat Pasha, the ruling Al Thani tribe submitted to Ottoman rule in 1871. The Ottoman government imposed reformist (Tanzimat) measures concerning taxation and land registration to fully integrate these areas into the empire. Despite the disapproval of local tribes, Al Thani continued supporting Ottoman rule. However, Qatari-Ottoman relations soon stagnated, and in 1882 they suffered further setbacks when the Ottomans refused to aid Al Thani in his expedition of Abu Dhabi-occupied Khawr al Udayd. In addition, the Ottomans supported the Ottoman subject Mohammed bin Abdul Wahab who attempted to supplant Al Thani as kaymakam of Qatar in 1888. This eventually led Al Thani to rebel against the Ottomans, whom he believed were seeking to usurp control of the peninsula. He resigned as kaymakam and stopped paying taxes in August 1892. In February 1893, Mehmed Hafiz Pasha arrived in Qatar in the interests of seeking unpaid taxes and accosting Jassim bin Mohammed's opposition to proposed Ottoman administrative reforms. Fearing that he would face death or imprisonment, Jassim retreated to Al Wajbah (10 miles west of Doha), accompanied by several tribe members. Mehmed's demand that Jassim disband his troops and pledge his loyalty to the Ottomans was met with refusal. In March, Mehmed imprisoned Jassim's brother and 13 prominent Qatari tribal leaders on the Ottoman corvette Merrikh as punishment for his insubordination. After Mehmed declined an offer to release the captives for a fee of 10,000 liras, he ordered a column of approximately 200 troops to advance towards Jassim's Al Wajbah Fort under the command of Yusuf Effendi, thus signalling the start of the Battle of Al Wajbah. Effendi's troops came under heavy gunfire by a sizable troop of Qatari infantry and cavalry shortly after arriving to Al Wajbah. They retreated to Shebaka fortress, where they were again forced to draw back from a Qatari incursion. After they withdrew to Al Bidda fortress, Jassim's advancing column besieged the fortress, resulting in the Ottomans' concession of defeat and agreement to relinquish their captives in return for the safe passage of Mehmed Pasha's cavalry to Hofuf by land. Although Qatar did not gain full independence from the Ottoman Empire, the result of the battle forced a treaty that would later form the basis of Qatar's emerging as an autonomous country within the empire. The Ottoman Empire fell into disorder after losing battles in different fronts in the Middle Eastern theatre of World War I. Qatar took part in the Arab revolt against the Ottomans. The revolt was successful and Ottoman rule in the country further declined. The United Kingdom and the Ottoman Empire accorded their recognition to Sheikh Abdullah bin Jassim Al Thani and his successors' right to rule over the whole of the Qatari Peninsula. The Ottomans renounced all their rights to Qatar and, following the outbreak of the First World War, Abdullah bin Jassim Al Thani (who was pro-British) forced them to abandon Doha in 1915. As a result of the partitioning of the Ottoman Empire, Qatar became a British protectorate on 3 November 1916. On that day, the United Kingdom signed a treaty with Sheikh Abdullah bin Jassim Al Thani to bring Qatar under its Trucial System of Administration. While Abdullah agreed not to enter into any relations with any other power without prior consent of the British government, the British guaranteed the protection of Qatar from all aggression by sea. On 5 May 1935, Abdullah signed another treaty with the British government which granted Qatar protection against internal and external threats. Oil reserves were first discovered in 1939. However, exploitation was delayed by World War II. The influence of the British Empire started diminishing after World War II, particularly following the independence of India and creation of Pakistan in 1947. Oil exports began in 1949, and oil revenues became the country's main source of revenue, the pearl trade having gone into decline. These revenues were used to fund the expansion and modernisation of Qatar's infrastructure. When Britain officially announced in 1968 that it would politically disengage from the Persian Gulf in three years' time, Qatar joined talks with Bahrain and seven other Trucial States to create a federation. Regional disputes, however, persuaded Qatar and Bahrain to withdraw from the talks and become independent states separately from the Trucial States, which went on to become the United Arab Emirates. Traditional dhows in front of the West Bay skyline as seen from the Doha Corniche. On 3 November 1916, the sheikh of Qatar entered into treaty relations with the United Kingdom. The treaty reserved foreign affairs and defence to the United Kingdom but allowed internal autonomy. On 3 September 1971, those "special treaty arrangements" that were "inconsistent with full international responsibility as a sovereign and independent state" were terminated. This was done under an agreement reached between the Ruler of Qatar and the Government of the United Kingdom. In 1991, Qatar played a significant role in the Gulf War, particularly during the Battle of Khafji in which Qatari tanks rolled through the streets of the town and provided fire support for Saudi Arabian National Guard units that were engaging Iraqi Army troops. Qatar allowed coalition troops from Canada to use the country as an airbase to launch aircraft on CAP duty and also permitted air forces from the United States and France to operate in its territories. In 1995, Emir Hamad bin Khalifa Al Thani seized control of the country from his father Khalifa bin Hamad Al Thani, with the support of the armed forces and cabinet, as well as neighbouring states and France. Under Emir Hamad, Qatar has experienced a moderate degree of liberalisation, including the launch of the Al Jazeera television station (1996), the endorsement of women's suffrage or right to vote in municipal elections (1999), drafting its first written constitution (2005) and inauguration of a Roman Catholic church (2008). In 2010, Qatar won the rights to host the 2022 FIFA World Cup, making it the first country in the Middle East to be selected to host the tournament. The Emir announced Qatar's plans to hold its first national legislative elections in 2013. They were scheduled to be held in the second half of 2013, but were postponed in June 2013 and may be delayed until 2019. The legislative council will also host the 140th Inter-Parliamentary Union Assembly for the first time in April 2019. In 2003, Qatar served as the US Central Command headquarters and one of the main launching sites of the invasion of Iraq. In March 2005, a suicide bombing killed a British teacher at the Doha Players Theatre, shocking the country, which had not previously experienced acts of terrorism. The bombing was carried out by Omar Ahmed Abdullah Ali, an Egyptian resident in Qatar who had suspected ties to Al-Qaeda in the Arabian Peninsula. In 2011, Qatar joined NATO operations in Libya and reportedly armed Libyan opposition groups. It is also currently a major funder of weapons for rebel groups in the Syrian civil war. Qatar is pursuing an Afghan peace deal and in January 2012 the Afghan Taliban said they were setting up a political office in Qatar to facilitate talks. This was done in order to facilitate peace negotiations and with the support of other countries including the United States and Afghanistan. Ahmed Rashid, writing in the Financial Times, stated that through the office Qatar has "facilitated meetings between the Taliban and many countries and organisations, including the US state department, the UN, Japan, several European governments and non-governmental organisations, all of whom have been trying to push forward the idea of peace talks. Suggestions in September 2017 by the presidents of both the United States and Afghanistan have reportedly led to protests from senior officials of the American State Department. In June 2013, Sheikh Tamim bin Hamad Al Thani became the Emir of Qatar after his father handed over power in a televised speech. Sheikh Tamim has prioritised improving the domestic welfare of citizens, which includes establishing advanced healthcare and education systems, and expanding the country's infrastructure in preparation for the hosting of the 2022 World Cup. Qatar participated in the Saudi Arabian-led intervention in Yemen against the Houthis and forces loyal to former President Ali Abdullah Saleh, who was deposed in the 2011 Arab Spring uprisings. The increased influence of Qatar and its role during the Arab Spring, especially during the Bahraini uprising in 2011, worsened longstanding tensions with Saudi Arabia, the neighboring United Arab Emirates (UAE), and Bahrain. In June 2017, Egypt, Saudi Arabia, United Arab Emirates, and Bahrain cut off diplomatic relations with Qatar, citing the country's alleged support of groups they considered to be extremist. This has resulted in increased Qatari economic and military ties with Turkey and Iran. Qatar is expected to host the 2022 FIFA World Cup from 21 November to 18 December, becoming the first Arab country to do so. Emir Tamim bin Hamad Al Thani with U.S. President Donald Trump in May 2017. Qatar is either a constitutional or an absolute monarchy ruled by the Al Thani family. The Al Thani dynasty has been ruling Qatar since the family house was established in 1825. In 2003, Qatar adopted a constitution that provided for the direct election of 30 of the 45 members of the Legislative Council. The constitution was overwhelmingly approved in a referendum, with almost 98% in favour. The eighth Emir of Qatar is Tamim bin Hamad Al Thani, whose father Hamad bin Khalifa Al Thani handed power to him on 25 June 2013. The supreme chancellor has the exclusive power to appoint and remove the prime minister and cabinet ministers who, together, constitute the Council of Ministers, which is the supreme executive authority in the country. The Council of Ministers also initiates legislation. Laws and decrees proposed by the Council of Ministers are referred to the Advisory Council (Majilis Al Shura) for discussion after which they are submitted to the Emir for ratification. A Consultative Assembly has limited legislative authority to draft and approve laws, but the Emir has final say on all matters. The current Council is composed entirely of members appointed by the Emir, as no legislative elections have been held since 1970 when there were partial elections to the body. Legislative elections have been postponed until at least 2019. The Council will also host the 140th Inter-Parliamentary Union Assembly for the first time, in April 2019. Qatari law does not permit the establishment of political bodies or trade unions. According to Qatar's Constitution, Sharia law is the main source of Qatari legislation, although in practice, Qatar's legal system is a mixture of civil law and Sharia law. Sharia law is applied to family law, inheritance, and several criminal acts (including adultery, robbery and murder). In some cases, Sharia-based family courts treat a female's testimony as being worth half that of a man. Codified family law was introduced in 2006. Islamic polygyny is permitted. Judicial corporal punishment is common in Qatar due to the Wahhabi interpretation of Sharia Law, although in Qatar it had originally been a Hanbali school of mainstream Sunnism. Flogging is employed as a punishment for alcohol consumption or illicit sexual relations. Article 88 of Qatar's criminal code declares that the penalty for adultery is 100 lashes, and in 2006, a Filipino woman received that punishment. In 2010, at least 18 people (mostly foreign nationals) were sentenced to receive between 40 and 100 lashes for offences involving "illicit sexual relations" or alcohol consumption. In 2011, at least 21 people (mostly foreign nationals) were sentenced to between 30 and 100 lashes for the same reasons, and in 2012, six expatriates were sentenced to either 40 or 100 lashes. Only Muslims considered medically fit are liable to have such sentences carried out. It is unknown if the sentences were implemented. In April 2013, a Muslim expatriate was sentenced to 40 lashes for alcohol consumption, and in June 2014, a Muslim expatriate was sentenced to 40 lashes for consuming alcohol and driving under the influence.Stoning is a legal punishment in Qatar, and apostasy and homosexuality are crimes punishable by the death penalty. Blasphemy can result in up to seven years in prison, while proselytising can incur a 10-year sentence. Alcohol consumption is partially legal in Qatar; some five-star luxury hotels are allowed to sell alcohol to their non-Muslim customers. Muslims are not allowed to consume alcohol, and those caught consuming it are liable to flogging or deportation. Non-Muslim expatriates can obtain a permit to purchase alcohol for personal consumption. 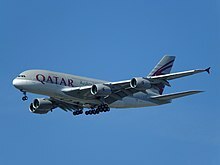 The Qatar Distribution Company (a subsidiary of Qatar Airways) is permitted to import alcohol and pork; it operates the one and only liquor store in the country, which also sells pork to holders of liquor licences. Qatari officials have also indicated a willingness to allow alcohol in "fan zones" at the 2022 FIFA World Cup. Until 2011, restaurants on the Pearl-Qatar (a man-made island near Doha) were allowed to serve alcoholic drinks. In December 2011, however, Pearl restaurants were told to stop selling alcohol. No explanation was given for the ban, though speculation included encouraging a more pious image before a significant election and rumours of a financial dispute between the government and resort developers. The alcohol ban was later lifted. In 2014, a modesty campaign was launched to remind tourists of the country's restrictive dress code. Female tourists were advised not to wear leggings, miniskirts, sleeveless dresses, or short or tight clothing in public. Men were warned against wearing only shorts and singlets. According to the U.S. State Department, expatriate workers from nations throughout Asia and parts of Africa voluntarily migrate to Qatar as low-skilled labourers or domestic servants, but some subsequently face conditions indicative of involuntary servitude. Some of the more common labour rights violations include beatings, withholding of payment, charging workers for benefits for which the employer is responsible, restrictions on freedom of movement (such as the confiscation of passports, travel documents, or exit permits), arbitrary detention, threats of legal action, and sexual assault. Many migrant workers arriving for work in Qatar have paid exorbitant fees to recruiters in their home countries. As of 2014[update], certain provisions of the Qatari Criminal Code allows punishments such as flogging and stoning to be imposed as criminal sanctions. The UN Committee Against Torture found that these practices constituted a breach of the obligations imposed by the UN Convention Against Torture. Qatar retains the death penalty, mainly for threats against national security such as terrorism. Use of the death penalty is rare and no state executions have taken place in Qatar since 2003. In Qatar, homosexual acts are illegal and can be punished by death. Under the provisions of Qatar's sponsorship law, sponsors have the unilateral power to cancel workers' residency permits, deny workers' ability to change employers, report a worker as "absconded" to police authorities, and deny permission to leave the country. As a result, sponsors may restrict workers' movements and workers may be afraid to report abuses or claim their rights. According to the ITUC, the visa sponsorship system allows the exaction of forced labour by making it difficult for a migrant worker to leave an abusive employer or travel overseas without permission. Qatar also does not maintain wage standards for its immigrant labourers. Qatar commissioned international law firm DLA Piper to produce a report investigating the immigrant labour system. In May 2014 DLA Piper released over 60 recommendations for reforming the kafala system including the abolition of exit visas and the introduction of a minimum wage which Qatar has pledged to implement. In May 2012, Qatari officials declared their intention to allow the establishment of an independent trade union. Qatar also announced it will scrap its sponsor system for foreign labour, which requires that all foreign workers be sponsored by local employers. Additional changes to labour laws include a provision guaranteeing that all workers' salaries are paid directly into their bank accounts and new restrictions on working outdoors in the hottest hours during the summer. New draft legislation announced in early 2015 mandates that companies that fail to pay workers' wages on time could temporarily lose their ability to hire more employees. In October 2015 Qatar's Emir signed into law new reforms to the country's sponsorship system, with the new law taking effect within one year. Critics claim that the changes could fail to address some labour rights issues. The country enfranchised women at the same time as men in connection with the 1999 elections for a Central Municipal Council. These elections—the first ever in Qatar—were deliberately held on 8 March 1999, International Women's Day. Former Emir Hamad bin Khalifa Al Thani and U.S. Secretary of State John Kerry in 2013. As a small country with larger neighbours, Qatar seeks to project influence and protect its state and ruling dynasty. The history of Qatar's alliances provides insight into the basis of their policy. Between 1760 and 1971, Qatar sought formal protection from the high transitory powers of the Ottomans, British, the Al-Khalifas from Bahrain, the Arabians, and the Wahhabis from Saudi Arabia. [page needed] Qatar's rising international profile and active role in international affairs has led some analysts to identify it as a middle power. Qatar was an early member of OPEC and a founding member of the Gulf Cooperation Council (GCC). It is a member of the Arab League. The country has not accepted compulsory International Court of Justice jurisdiction. Embassy of Qatar in Washington, D.C.
Qatar also has bilateral relationships with a variety of foreign powers. Qatar is a strategic ally of China, with relationship between the two countries growing stronger. It also hosts the Al Udeid Air Base, a joint U.S.-British base, which acts as the hub for all American and British air operations in the Persian Gulf. It has allowed American and British forces to use an air base to send supplies to Iraq and Afghanistan. According to leaked documents published in The New York Times, Qatar's record of counter-terrorism efforts was the "worst in the region". The cable suggested that Qatar's security service was "hesitant to act against known terrorists out of concern for appearing to be aligned with the U.S. and provoking reprisals". Qatar has mixed relations with its neighbours in the Persian Gulf region. Qatar signed a defence co-operation agreement with Iran, with whom it shares the largest single non-associated gas field in the world. It was the second nation, the first being France, to have publicly announced its recognition of the Libyan opposition's National Transitional Council as the legitimate government of Libya amidst the 2011 Libyan civil war. In 2014, Qatar's relations with Bahrain, Saudi Arabia, and the United Arab Emirates came to a boiling point over Qatar's support for the Muslim Brotherhood and reportedly funding extremist groups in Syria. This culminated in the three aforementioned countries withdrawing their ambassadors from Qatar in March 2014. Qatar was also involved in the CIA-led Timber Sycamore covert operation to train and arm Syrian rebels. Qatar's flag in Libya after the Libyan Civil War; Qatar played an influential role during the Arab Spring. In recent years, Qatar has been using Islamist militants in a number of countries including Egypt, Syria, Libya, Somalia and Mali to further its foreign policy. Courting Islamists from the Muslim Brotherhood to Salafist groups has served as a power amplifier for the country, as it believes since the beginning of the Arab Spring that these groups represented the wave of the future. David Cohen, the Under Secretary for terrorism and financial intelligence at the U.S. Treasury, said that Qatar is a "permissive jurisdiction for terrorist financing." There is evidence that these groups supported by Qatar include the hard-line Islamic militant groups active in northern Syria. As of 2015[update], Qatar, Saudi Arabia and Turkey are openly backing the Army of Conquest, an umbrella group of anti-government forces fighting in the Syrian Civil War that reportedly includes an al-Qaeda linked al-Nusra Front and another Salafi coalition known as Ahrar ash-Sham. Qatar supported the democratically elected President Mohamed Morsi with diplomatic support and the state-owned Al Jazeera network before he was deposed in a military coup led by Abdel Fattah el-Sisi. Qatar offered Egypt a $7.5 billion loan during the year he was in power. Qatar's alignment with Hamas, first reported in early 2012, has drawn criticism from Israel, the United States, Egypt and Saudi Arabia, "who accuse Qatar of undermining regional stability by supporting Hamas." However, the Foreign Minister of Qatar has denied supporting Hamas and corrected their alleged claims, stating "We do not support Hamas but we support the Palestinians." Following a peace agreement, Qatar pledged $1 billion in humanitarian aid to Gaza. The US Combined Air and Space Operations Center (CAOC) at Al Udeid Air Base provides command and control of air power throughout Iraq, Syria, Afghanistan, and 17 other nations. 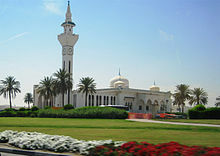 Qatar has hosted academic, religious, political, and economic conferences. The 11th annual Doha Forum recently brought in key thinkers, professionals of various backgrounds, and political figures from all over the world to discuss democracy, media and information technology, free trade, and water security issues. In addition, the forum has featured the Middle East Economic Future conference since 2006. In more recent times, Qatar has hosted peace talks between rival factions across the globe. Notable among these include the Darfur Agreement. The Doha Declaration is the basis of the peace process in Darfur and it has achieved significant gains on the ground for the African region. Notable achievements included the restoration of security and stability, progress made in construction and reconstruction processes, return of displaced residents and uniting of Darfur people to face challenges and push forward the peace process. Qatar donated £88.5million in funds to finance recovery and reconstruction in Darfur. In June 2017, Saudi Arabia, the UAE, Bahrain, Egypt and Yemen broke diplomatic ties with Qatar, accusing Qatar of supporting terrorism, escalating a dispute over Qatar's support of the Muslim Brotherhood, considered a terrorist organization by those 5 Arab nations. Saudi Arabia explained the move to be a necessary measure in protecting the kingdom's security. Qatari troops were also removed from the military coalition in Yemen. Egypt closed its airspace and seaports to all Qatari transportation. In June 2018, Saudi Arabia announced a bid to construct a waterway, Salwa Canal, on their border with Qatar which shall in effect turn the latter into an island country. The Qatar Armed Forces are the military forces of Qatar. The country maintains a modest military force of approximately 11,800 men, including an army (8,500), navy (1,800) and air force (1,500). Qatar's defense expenditures accounted for approximately 4.2% of gross national product in 1993, and 1.5% of gross domestic product in 2010, the most recent year available in the SIPRI statistical database. Qatar has recently signed defense pacts with the United States and United Kingdom, as well as with France earlier in 1994. Qatar plays an active role in the collective defense efforts of the Gulf Cooperation Council; the other five members are Saudi Arabia, Kuwait, Bahrain, the UAE, and Oman. The presence of the large Al Udeid Air Base, operated by the United States and several other UN nations, provides a guaranteed source of defense and national security. In 2008 Qatar spent US$2.3 billion on military expenditures, 2.3% of the gross domestic product. Qatari special forces have been trained by France and other Western countries, and are believed to possess considerable skill. They also helped the Libyan rebels during the 2011 Battle of Tripoli. The Stockholm International Peace Research Institute (SIPRI) found that in 2010–14 Qatar was the 46th-largest arms importer in the world. However, SIPRI writes, Qatar's plans to transform and significantly enlarge its armed forces have accelerated. Orders in 2013 for 62 tanks and 24 self-propelled guns from Germany were followed in 2014 by a number of other contracts, including 24 combat helicopters and 3 early-warning-and-control aircraft from the US, and 2 tanker aircraft from Spain. In 2015, Qatar was the 16th largest arms importer in the world, and in 2016, it was the 11th largest, according to SIPRI. Qatar's military participated in the Saudi Arabian-led intervention in Yemen against the Shia Houthis. In 2015, Al Jazeera America reported: "Numerous reports suggest that the Saudi-led coalition against opposition groups in Yemen has indiscriminately attacked civilians and used cluster bombs in civilian-populated areas, in violation of international law." Many civilians have been killed and the large parts of the infrastructure in this region is now destroyed. Hospitals have also been bombed by the Saudis and those operating with them. Qatar was suspended from the coalition in Yemen due to the 2017 Qatar diplomatic crisis. Since 2014, Qatar has been divided into eight municipalities (Arabic: baladiyah). For statistical purposes, the municipalities are further subdivided into 98 zones (as of 2015[update]), which are in turn subdivided into blocks. The Qatari peninsula protrudes 160 kilometres (100 mi) into the Persian Gulf, north of Saudi Arabia. It lies between latitudes 24° and 27° N, and longitudes 50° and 52° E. Most of the country consists of a low, barren plain, covered with sand. To the southeast lies the Khor al Adaid ("Inland Sea"), an area of rolling sand dunes surrounding an inlet of the Persian Gulf. There are mild winters and very hot, humid summers. The highest point in Qatar is Qurayn Abu al Bawl at 103 metres (338 ft) in the Jebel Dukhan to the west, a range of low limestone outcroppings running north-south from Zikrit through Umm Bab to the southern border. The Jebel Dukhan area also contains Qatar's main onshore oil deposits, while the natural gas fields lie offshore, to the northwest of the peninsula. Qatar signed the Rio Convention on Biological Diversity on 11 June 1992, and became a party to the convention on 21 August 1996. It has subsequently produced a National Biodiversity Strategy and Action Plan, which was received by the convention on 18 May 2005. A total of 142 fungal species have been recorded from Qatar. A book recently produced by the Ministry of Environment documents the lizards known or believed to occur in Qatar, based on surveys conducted by an international team of scientists and other collaborators. For two decades, Qatar has had the highest per-capita carbon dioxide emissions in the world, at 49.1 metric tons per person in 2008. Qataris are also some of the highest consumers of water per capita per day, using around 400 litres. In 2008 Qatar launched its National Vision 2030 which highlights environmental development as one of the four main goals for Qatar over the next two decades. The National Vision pledges to develop sustainable alternatives to oil-based energy to preserve the local and global environment. Graphical depiction of Qatar's product exports in 28 color-coded categories (2011). Before the discovery of oil, the economy of the Qatari region focused on fishing and pearl hunting. A report prepared by local governors of Ottoman Empire in 1892 states that total income from pearl hunting in 1892 is 2,450,000 kran. After the introduction of the Japanese cultured pearl onto the world market in the 1920s and 1930s, Qatar's pearling industry crashed. Oil was discovered in Qatar in 1940, in Dukhan Field. The discovery transformed the state's economy. Now, the country has a high standard of living for its legal citizens. With no income tax, Qatar (along with Bahrain) is one of the countries with the lowest tax rates in the world. The unemployment rate in June 2013 was 0.1%. Corporate law mandates that Qatari nationals must hold 51% of any venture in the Emirate. As of 2016[update], Qatar has the fourth highest GDP per capita in the world, according to the International Monetary Fund. It relies heavily on foreign labor to grow its economy, to the extent that migrant workers compose 86% of the population and 94% of the workforce. Qatar has been criticized by the International Trade Union Confederation. The economic growth of Qatar has been almost exclusively based on its petroleum and natural gas industries, which began in 1940. Qatar is the leading exporter of liquefied natural gas. In 2012, it was estimated that Qatar would invest over $120 billion in the energy sector in the next ten years. The country was a member state of Organization of Petroleum Exporting Countries (OPEC), having joined in 1961, and having left in January 2019. Qatar Airways Airbus A380, Qatar Airways, one of the world's largest airlines, links over 150 international destinations from its base in Doha. 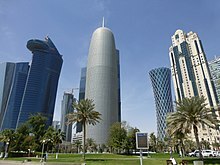 In 2012, Qatar retained its title of richest country in the world (according to per capita income) for the third time in a row, having first overtaken Luxembourg in 2010. According to the study published by the Washington-based Institute of International Finance, Qatar's per capita GDP at purchasing power parity (PPP) was $106,000 (QR387,000) in 2012, helping the country retain its ranking as the world's wealthiest nation. Luxembourg came a distant second with nearly $80,000 and Singapore third with per capita income of about $61,000. The research put Qatar's GDP at $182bn in 2012 and said it had climbed to an all-time high due to soaring gas exports and high oil prices. Its population stood at 1.8 million in 2012. The same study published that Qatar Investment Authority (QIA), with assets of $115bn, was ranked 12th among the richest sovereign wealth funds in the world. Qatar Central Bank's office in Doha. Established in 2005, Qatar Investment Authority is the country's sovereign wealth fund, specializing in foreign investment. Due to billions of dollars in surpluses from the oil and gas industry, the Qatari government has directed investments into United States, Europe, and Asia Pacific. As of 2013[update], the holdings were valued at $100 billion in assets. Qatar Holding is the international investment arm of QIA. Since 2009, Qatar Holding has received $30–40bn a year from the state. As of 2014[update], it has investments around the world in Valentino, Siemens, Printemps, Harrods, The Shard, Barclays Bank, Heathrow Airport, Paris Saint-Germain F.C., Volkswagen Group, Royal Dutch Shell, Bank of America, Tiffany, Agricultural Bank of China, Sainsbury's, BlackBerry, and Santander Brasil. The country has no taxes, but authorities have announced plans to levy taxes on junk food and luxury items. The taxes would be implemented on goods that harm the human body – for example fast food, tobacco products, and soft drinks. The rollout of these initial taxes is believed to be due to the fall in oil prices and a deficit that the country faced in 2016. Additionally, the country has seen job cuts in 2016 from its petroleum companies and other sectors in the government. As of 2012[update], Qatar has proven oil reserves of 15 billion barrels and gas fields that account for more than 13% of the global resource. As a result, it is the richest state per-capita in the world. None of its 2 million residents live below the poverty line and less than 1% are unemployed. Qatar's economy was in a downturn from 1982 to 1989. OPEC quotas on crude oil production, the lower price for oil, and the generally unpromising outlook on international markets reduced oil earnings. In turn, the Qatari government's spending plans had to be cut to match lower income. The resulting recessionary local business climate caused many firms to lay off expatriate staff. With the economy recovering in the 1990s, expatriate populations, particularly from Egypt and South Asia, have grown again. Oil production will not remain at the peak level of 500,000 barrels (80,000 m³) per day for long as the national oil fields are projected to be largely depleted by 2023. However, large natural gas reserves have been located off Qatar's northeast coast. Qatar's proved reserves of gas are the third-largest in the world, exceeding 250 trillion cubic feet (7,000 km³). The economy was boosted in 1991 by completion of the $1.5-billion Phase I of North Field gas development. In 1996, the Qatargas project began exporting liquefied natural gas (LNG) to Japan. Further phases of North Field gas development costing billions of dollars are in various stages of planning and development. Qatar's heavy industrial projects, all based in Umm Said, include a refinery with a 50,000 barrels (8,000 m³) per day capacity, a fertiliser plant for urea and ammonia, a steel plant, and a petrochemical plant. All these industries use gas for fuel. Most are joint ventures between European and Japanese firms and the state-owned Qatar General Petroleum Corporation (QGPC). The US is the major equipment supplier for Qatar's oil and gas industry, and US companies are playing a major role in North Field gas development. Qatar's National Vision 2030 has made investment in renewable resources a major goal for the country over the next two decades. Qatar pursues a vigorous programme of "Qatarisation", under which all joint venture industries and government departments strive to move Qatari nationals into positions of greater authority. Growing numbers of foreign-educated Qataris, including many educated in the US, are returning home to assume key positions formerly occupied by expatriates. To control the influx of expatriate workers, Qatar has tightened the administration of its foreign manpower programmes over the past several years. Security is the principal basis for Qatar's strict entry and immigration rules and regulations. With a fast-expanding population and substantial economic growth over the past decade, a reliable and extensive transportation network is becoming increasingly necessary within Qatar. So far the government, the primary transport developer, has done well in terms of keeping up with demand for new transportation options. In 2008 the Public Works Authority (Ashghal), one of the bodies that oversees infrastructure development, underwent a major reorganisation in order to streamline and modernise the authority in preparation for major project expansions across all segments in the near future. Ashghal works in tandem with the Urban Planning and Development Authority (UPDA), the body that designed the transportation master plan, instituted in March 2006 and running to 2025. As driving is the primary mode of transport in Qatar, the road network is a major focus of the plan. Project highlights in this segment include the multibillion-dollar Doha Expressway and the Qatar Bahrain Causeway, which will connect Qatar to Bahrain and Saudi Arabia and is considered a milestone in regional interconnectivity. Mass-transit options, such as a Doha metro, light-rail system and more extensive bus networks, are also under development to ease road congestion. In addition, the railway system is being significantly expanded and could eventually form an integral part of a GCC-wide network linking all the Arab states of the Persian Gulf. The airport, too, is expanding capacity to keep up with rising visitor numbers. Hamad International Airport is the international airport of Doha. In 2014 replaced the former Doha International Airport as Qatar's principal airport. In 2016, the airport was named the 50th busiest airport in the world by passenger traffic, serving 37,283,987 passengers, a 20.2% increase from 2015. Hamad Port is Qatar's main seaport, located south of Doha in the Umm Al-Houl area. Construction of the port began in 2010; it became operational in December 2016. It was officially opened in September 2017, and is expected to become fully operational by 2020. Capable of handling up to 7.8 million tonnes of products annually, the bulk of trade which passes through the port consists of food and building materials. On the northern coast, Ras Laffan Port serves as the most extensive LNG exporting facility in the world. The number of people in Qatar fluctuates considerably depending on the season, since the country relies heavily on migrant labour. In early 2017, Qatar's total population was 2.6 million, with non-Arab foreigners making up a vast majority of Qatar's population. Only 313,000 of the population (12%) were Qatari citizens, while the remaining 2.3 million (88%) were expatriates. 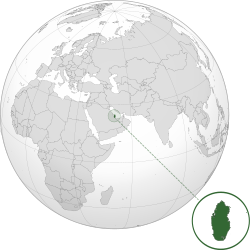 The combined number of South Asians (from the countries of the Indian subcontinent including Sri Lanka) by themselves represent over 1.5 million people (60%) of Qatar's population. Among these, Indians are the largest community, numbering 650,000 in 2017, followed by 350,000 Nepalis, 280,000 Bangladeshis, 145,000 Sri Lankans, and 125,000 Pakistanis. The contingent of expatriates which are not of South Asian origin represent around 28% of Qatar's population, of which the largest group is 260,000 Filipinos and 200,000 Egyptians, plus many other nationalities (including nationals of other Arab countries, Europeans, etc.). Qatar's first demographic records date back to 1892, and were conducted by Ottoman governors in the region. Based on this census, which includes only the residents in cities, the total population in 1892 was 9,830. The 2010 census recorded the total population at 1,699,435. In January 2013, the Qatar Statistics Authority estimated the country's population at 1,903,447, of which 1,405,164 were males and 498,283 females. At the time of the first census, held in 1970, the population was 111,133. The population has tripled in the decade to 2011, up from just over 600,000 people in 2001, leaving Qatari nationals as less than 15% of the total population. The influx of male labourers has skewed the gender balance, and women are now just one-quarter of the population. Projections released by Qatar Statistical Authority indicates that the total population of Qatar could reach 2.8 million by 2020. Qatar's National Development Strategy (2011–16) had estimated that the country's population would reach 1.78m in 2013, 1.81m in 2014, 1.84m in 2015 and 1.86m in 2016 – the yearly growth rate being merely 2.1%. But the country's population has soared to 1.83 million by the end of 2012, showing 7.5% growth over the previous year. Qatar's total population hit a record high of 2.46 million in November 2015, an increase of 8.5% from the previous year, far exceeding official projections. Islam is Qatar's predominant religion and is the official status although not the only religion practiced in the country. Most Qatari citizens belong to the Salafi Muslim movement of Wahhabism, and between 5–15% of Muslims in Qatar follow Shia Islam with other Muslims sects being very small in number. In 2010, Qatar's population was 67.7% Muslim, 13.8% Christian, 13.8% Hindu, and 3.1% Buddhist; other religions and religiously unaffiliated people accounted for the remaining 1.6%. Sharia law is the main source of Qatari legislation according to Qatar's Constitution. The Christian population is composed almost entirely of foreigners. Since 2008, Christians have been allowed to build churches on ground donated by the government, though foreign missionary activity is officially discouraged. Active churches include the Mar Thoma Church, Malankara Orthodox Syrian Church, the Roman Catholic Church of Our Lady of the Rosary and the Anglican Church of the Epiphany. There are also two Mormon wards. Arabic is the official language of Qatar, with Qatari Arabic the local dialect. Qatari Sign Language is the language of the deaf community. English is commonly used as a second language, and a rising lingua franca, especially in commerce, to the extent that steps are being taken to try to preserve Arabic from English's encroachment. English is particularly useful for communication with Qatar's large expatriate community. In the medical community, and in situations such as the training of nurses to work in Qatar, English acts as a lingua franca. Reflecting the multicultural make-up of the country, many other languages are also spoken, including Persian, Baluchi, Brahui, Hindi, Malayalam, Urdu, Pashto, Kannada, Tamil, Telugu, Nepali, Sinhalese, Bengali, Tagalog, and Bahasa Indonesia. In 2012, Qatar joined the international French-speaking organisation of La Francophonie (OIF) as a new associate member. However, in December 2013, the French daily Le Monde revealed that Qatar, which has very few native French speakers, had not yet paid any contribution to the OIF, while the outgoing Administrator of the OIF complained in 2015 that Qatar had not kept any of the promises it made when it joined the organisation and had never paid its annual membership fees. Qatar's culture is similar to other countries in Eastern Arabia, being significantly influenced by Islam. Qatar National Day, hosted annually on 18 December, has had an important role in developing a sense of national identity. It is observed in remembrance of Jassim bin Mohammed Al Thani's succession to the throne and his subsequent unification of the country's various tribes. Since 1 July 2008, Hamad Bin Abdulaziz Al-Kawari has been the Minister for Culture, Arts and Heritage of Qatar. Several senior members of Qatar's ruling Al Thani family are noted collectors of Islamic and contemporary art. The Museum of Islamic Art, opened in 2008, is regarded as one of the best museums in the region. This, and several other Qatari museums, like the Arab Museum of Modern Art, falls under the Qatar Museums Authority (QMA) which is led by Sheikha Al-Mayassa bint Hamad bin Khalifa Al-Thani, the sister of the ruling Emir of the State of Qatar, and the prominent collector and art patron Sheikh Hassan bin Mohammed Al Thani. The QMA also sponsors artistic events abroad, such as major exhibitions by Takahashi Murakami in Versailles (2010) and Damien Hirst in London (2012). Qatar is the world's biggest buyer in the art market by value. The Qatari cultural sector is being developed to enable the country to reach world recognition to contribute to the development of a country that comes mainly from its resources from the gas industry. The National Museum of Qatar is currently under construction, located across from the Corniche in the Qatari capital Doha. It was originally scheduled to open in 2016 but its opening was pushed back to 28 March 2019. Qatari literature traces its origins back to the 19th century. Originally, written poetry was the most common form of expression. Abdul Jalil Al-Tabatabai and Mohammed bin Abdullah bin Uthaymeen, two poets dating back to the early 19th century, formed the corpus of Qatar's earliest written poetry. Poetry later fell out of favor after Qatar began reaping the profits from oil exports in the mid-20th century and many Qataris abandoned their Bedouin traditions in favor of more urban lifestyles. Due to the increasing number of Qataris who began receiving formal education during the 1950s and other significant societal changes, 1970 witnessed the introduction of the first short story anthology, and in 1993 the first locally authored novels were published. Poetry, particularly the predominant nabati form, retained some importance but would soon be overshadowed by other literary types. Unlike most other forms of art in Qatari society, females have been involved in the modern literature movement on a similar magnititude to males. Qatar's media was classified as "not free" in the 2014 Freedom of the Press report by Freedom House. TV broadcasting in Qatar was started in 1970. Al Jazeera is a main television network headquartered in Doha, Qatar. 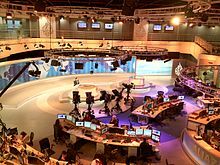 Al Jazeera initially launched in 1996 as an Arabic news and current affairs satellite TV channel of the same name, but has since expanded into a global network of several speciality TV channels known collectively as the Al Jazeera Media Network. It has been reported that journalists practice self-censorship, particularly in regards to the government and ruling family of Qatar. Criticism of the government, Emir and ruling family in the media is illegal. According to article 46 of the press law "The Emir of the state of Qatar shall not be criticised and no statement can be attributed to him unless under a written permission from the manager of his office." Journalists are also subject to prosecution for insulting Islam. In 2014, a Cybercrime Prevention Law was passed. The law is said to restrict press freedom, and carries prison sentences and fines for broad reasons such as jeopardising local peace or publishing false news. The Gulf Center for Human Rights has stated that the law is a threat to freedom of speech and has called for certain articles of the law to be revoked. Press media has undergone expansion in recent years. There are currently seven newspapers in circulation in Qatar, with four being published in Arabic and three being published in English. There are also newspapers from India, Nepal and Sri Lanka with editions printed from Qatar. In regards to telecommunication infrastructure, Qatar is the highest ranked Middle Eastern country in the World Economic Forum's Network Readiness Index (NRI) – an indicator for determining the development level of a country's information and communication technologies. Qatar ranked number 23 overall in the 2014 NRI ranking, unchanged from 2013. The music of Qatar is based on Bedouin poetry, song and dance. Traditional dances in Doha are performed on Friday afternoons; one such dance is the Ardah, a stylised martial dance performed by two rows of dancers who are accompanied by an array of percussion instruments, including al-ras (a large drum whose leather is heated by an open fire), tambourines and cymbals with small drums. Other percussion instruments used in folk music include galahs (a tall clay jar) and tin drinking cups known as tus or tasat, usually used in conjunction with a tabl, a longitudinal drum beaten with a stick. String instruments, such as the oud and rebaba, are also commonly used. Association football is the most popular sport in Qatar, both in terms of players and spectators. Shortly after the Qatar Football Association became affiliated with FIFA in 1970, one of the country's earliest international accolades came in 1981 when the Qatar national under-20 team's emerged as runners-up to West Germany in that year's edition of the FIFA World Youth Championship after being defeated 4–0 in the final. At the senior level, Qatar has played host to two editions of the AFC Asian Cup; the first coming being the 9th edition in 1988 and the second being the 15th edition held in 2011. For the first time in the country's history, the Qatar national football team won the AFC Asian Cup in the 2019 edition hosted in the UAE, beating Japan 3–1 in the final. They won all seven of their matches, conceding only a single goal throughout the tournament. On 2 December 2010, Qatar won their bid to host the 2022 FIFA World Cup, despite never previously qualifying for the FIFA World Cup Finals. Local organisers are planning to build 9 new stadiums and expand 3 existing stadiums for this event. Qatar's winning bid for the 2022 World Cup was greeted enthusiastically in the Persian Gulf region as it was the first time a country in the Middle East had been selected to host the tournament. However, the bid has been embroiled in much controversy, including allegations of bribery and interference in the investigation of the alleged bribery. European football associations have also objected to the 2022 World Cup being held in Qatar for a variety of reasons, from the impact of warm temperatures on players' fitness, to the disruption it might cause in European domestic league calendars should the event be rescheduled to take place during winter. In May 2014, Qatari football official Mohammed bin Hammam was accused of making payments totalling £3m to officials in return for their support for the Qatar bid. However, a FIFA inquiry into the bidding process in November 2014 cleared Qatar of any wrongdoing. The Guardian, a British national daily newspaper, produced a short documentary named "Abuse and exploitation of migrant workers preparing emirate for 2022". A 2014 investigation by The Guardian reports that migrant workers who have been constructing luxurious offices for the organisers of the 2022 World Cup have not been paid in over a year, and are now "working illegally from cockroach-infested lodgings." For 2014, Nepalese migrants involved in constructing infrastructure for the 2022 World Cup died at a rate of one every two days. The Qatar 2022 organising committee have responded to various allegations by claiming that hosting the World Cup in Qatar would act as a "catalyst for change" in the region. Though football is the most popular sport, other team sports have experienced considerable success at senior level. In 2015, the national handball team emerged as runners-up to France in the World Men's Handball Championship as hosts, however the tournament was marred by numerous controversies regarding the host nation and its team. Further, in 2014, Qatar won the world championship in men's 3x3 basketball. Khalifa International Tennis and Squash Complex in Doha hosted the WTA Tour Championships in women's tennis between 2008 and 2010. Doha holds the WTA Premier tournament Qatar Ladies Open annually. Since 2002, Qatar has hosted the annual Tour of Qatar, a cycling race in six stages. Every February, riders are racing on the roads across Qatar's flat land for six days. Each stage covers a distance of more than 100 km, though the time trial usually is a shorter distance. Tour of Qatar is organised by the Qatar Cycling Federation for professional riders in the category of Elite Men. The Qatar Army Skydiving Team has several different skydiving disciplines placing among the top nations in the world. The Qatar National Parachute team performs annually during Qatar's National Day and at other large events, such as the 2015 World Handball Championship. Doha four times was the host of the official FIVB Volleyball Men's Club World Championship and three times host FIVB Volleyball Women's Club World Championship. Doha one time Host Asian Volleyball Championship. Qatar hired the RAND Corporation to reform its K–12 education system. Through Qatar Foundation, the country has built Education City, a campus which hosts local branches of the Weill Cornell Medical College, Carnegie Mellon School of Computer Science, Georgetown University School of Foreign Service, Northwestern's Medill School of Journalism, Texas A&M's School of Engineering, Virginia Commonwealth University School of the Arts and other Western institutions. The illiteracy rate in Qatar was 3.1% for males and 4.2% for females in 2012, the lowest in the Arab-speaking world, but 86th in the world. Citizens are required to attend government-provided education from kindergarten through high school. 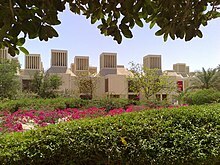 Qatar University, founded in 1973, is the country's oldest and largest institution of higher education. In November 2002, emir Hamad bin Khalifa Al Thani created The Supreme Education Council. The Council directs and controls education for all ages from the pre-school level through the university level, including the "Education for a New Era" initiative which was established to try to position Qatar as a leader in education reform. According to the Webometrics Ranking of World Universities, the top-ranking universities in the country are Qatar University (1,881st worldwide), Texas A&M University at Qatar (3,905th) and Weill Cornell Medical College in Qatar (6,855th). In 2008, Qatar established the Qatar Science & Technology Park in Education City to link those universities with industry. Education City is also home to a fully accredited international Baccalaureate school, Qatar Academy. In addition, two Canadian institutions, the College of the North Atlantic (headquarters in Newfoundland and Labrador) and the University of Calgary, have inaugurated campuses in Doha. Other for-profit universities have also established campuses in the city. In 2009, under the patronage of H.H. Sheikha Mozah Al Missned, the World Innovation Summit for Education (WISE) was established with the aim of transforming education through innovation. In 2012, Qatar was ranked third from the bottom of the 65 OECD countries participating in the PISA test of maths, reading and skills for 15- and 16-year-olds, comparable to Colombia or Albania, despite having the highest per capita income in the world. As part of its national development strategy, Qatar has outlined a 10-year strategic plan to improve the level of education. Furthermore, the government has launched educational outreach programs, such as Al-Bairaq. Al-Bairaq was launched in 2010 aims to provide high school students with an opportunity to experience a research environment in the Center for Advanced Materials in Qatar University. The program encompasses the STEM fields and languages. ^ a b c d e f g h "Qatar". CIA World Factbook. Central Intelligence Agency. 8 February 2012. Retrieved 4 March 2012. ^ "Population structure". Ministry of Development Planning and Statistics. 31 January 2017. ^ a b "Populations". Qsa.gov.qa. Archived from the original on 9 July 2010. Retrieved 2 October 2010. ^ a b c d "World Economic Outlook Database, April 2018 – Report for Selected Countries and Subjects". International Monetary Fund (IMF). April 2018. Archived from the original on 4 May 2018. ^ "GINI index". World Bank. Retrieved 22 January 2013. ^ "List of left- & right-driving countries – World Standards". Retrieved 5 June 2017. ^ "CMU Pronouncing Dictionary". CS. Retrieved 28 March 2010. ^ "How do you say 'Qatar'? Senate hearing has the answer". Washington Post. 12 June 2014. Retrieved 12 March 2015. ^ a b BBC News, How democratic is the Middle East?, 9 September 2005. ^ a b United States Department of State Country Reports on Human Rights Practices for 2011: Qatar, 2011. ^ "US State Dept's Country Political Profile – Qatar" (PDF). ^ a b Gardener, David. "Qatar shows how to manage a modern monarchy". Financial Times. ^ "The World Factbook". CIA Factbook. ^ a b "Canada – Qatar Bilateral Relations". Government of Canada. ^ a b c d "Population of Qatar by nationality – 2017 report". Retrieved 7 February 2017. ^ "The Constitution". Archived from the original on 24 October 2004. Retrieved 29 October 2017. ^ "Indices & Data | Human Development Reports". United Nations Development Programme. 14 March 2013. Archived from the original on 12 January 2013. Retrieved 27 June 2013. ^ a b "IFES Election Guide – Elections: Qatar Referendum Apr 29 2003". www.electionguide.org. Retrieved 5 June 2017. ^ a b "Qatar 2003". www.princeton.edu. Archived from the original on 10 October 2017. Retrieved 5 June 2017. ^ Dagher, Sam (17 October 2011). "Tiny Kingdom's Huge Role in Libya Draws Concern". Online.wsj.com. Retrieved 30 December 2013. ^ "Qatar: Rise of an Underdog". Politicsandpolicy.org. Retrieved 30 December 2013. ^ Ian Black in Tripoli. "Qatar admits sending hundreds of troops to support Libya rebels". Theguardian.com. Retrieved 30 December 2013. ^ Cooper, Andrew F. "Middle Powers: Squeezed out or Adaptive?". Public Diplomacy Magazine. Archived from the original on 17 March 2015. Retrieved 12 March 2015. ^ Kamrava, Mehran. "Mediation and Qatari Foreign Policy" (PDF). Archived from the original (PDF) on 7 October 2013. Retrieved 12 March 2015. ^ Casey, Paula; Vine, Peter (1992). The heritage of Qatar. Immel Publishing. p. 17. ^ a b "History of Qatar". Qatar Statistics Authority. Retrieved 11 May 2015. ^ "Maps". Qatar National Library. Retrieved 11 May 2015. ^ a b "About us". Katara. Archived from the original on 22 July 2015. Retrieved 11 May 2015. ^ Hazlitt, William (1851). The Classical Gazetteer: A Dictionary of Ancient Geography, Sacred and Profane. Whittaker & co.
^ Rahman, Habibur (2010). The Emergence of Qatar: The Turbulent Years 1627-1916. London: Routledge. p. 1. ISBN 9780710312136. ^ a b c Toth, Anthony. "Qatar: Historical Background." A Country Study: Qatar (Helen Chapin Metz, editor). Library of Congress Federal Research Division (January 1993). This article incorporates text from this source, which is in the public domain. ^ a b Khalifa, Haya; Rice, Michael (1986). Bahrain Through the Ages: The Archaeology. Routledge. pp. 79, 215. ISBN 978-0710301123. ^ a b "History of Qatar" (PDF). www.qatarembassy.or.th. Ministry of Foreign Affairs. Qatar. London: Stacey International, 2000. Retrieved 9 January 2015. ^ Rice, Michael (1994). Archaeology of the Persian Gulf. Routledge. pp. 206, 232–233. ISBN 978-0415032681. ^ Magee, Peter (2014). The Archaeology of Prehistoric Arabia. Cambridge Press. pp. 50, 178. ISBN 9780521862318. ^ Sterman, Baruch (2012). Rarest Blue: The Remarkable Story Of An Ancient Color Lost To History And Rediscovered. Lyons Press. pp. 21–22. ISBN 978-0762782222. ^ Cadène, Philippe (2013). Atlas of the Gulf States. BRILL. p. 10. ISBN 978-9004245600. ^ "Qatar – Early history". globalsecurity.org. Retrieved 17 January 2015. ^ Gillman, Ian; Klimkeit, Hans-Joachim (1999). Christians in Asia Before 1500. University of Michigan Press. pp. 87, 121. ISBN 978-0472110407. ^ Commins, David (2012). The Gulf States: A Modern History. I. B. Tauris. p. 16. ISBN 978-1848852785. ^ "AUB academics awarded $850,000 grant for project on the Syriac writers of Qatar in the 7th century AD" (PDF). American University of Beirut. 31 May 2011. Archived from the original (PDF) on 28 May 2015. Retrieved 12 May 2015. ^ Kozah, Mario; Abu-Husayn, Abdulrahim; Al-Murikhi, Saif Shaheen (2014). The Syriac Writers of Qatar in the Seventh Century. Gorgias Press LLC. p. 24. ISBN 978-1463203559. ^ a b c Fromherz, Allen (13 April 2012). Qatar: A Modern History. Georgetown University Press. pp. 44, 60, 98. ISBN 978-1-58901-910-2. ^ a b Rahman, Habibur (2006). The Emergence Of Qatar. Routledge. p. 34. ISBN 978-0710312136. ^ A political chronology of the Middle East. Routledge / Europa Publications. 2001. p. 192. ISBN 978-1857431155. ^ Page, Kogan (2004). Middle East Review 2003–04: The Economic and Business Report. Kogan Page Ltd. p. 169. ISBN 978-0749440664. ^ Qatar, 2012 (The Report: Qatar). Oxford Business Group. 2012. p. 233. ISBN 978-1907065682. ^ Casey, Paula; Vine, Peter (1992). The heritage of Qatar. Immel Publishing. pp. 184–185. ^ Russell, Malcolm (2014). The Middle East and South Asia 2014. Rowman & Littlefield Publishers. p. 151. ISBN 978-1475812350. ^ "History". qatarembassy.net. Archived from the original on 17 February 2015. Retrieved 18 January 2015. ^ Larsen, Curtis (1984). Life and Land Use on the Bahrain Islands: The Geoarchaeology of an Ancient Society (Prehistoric Archeology and Ecology series). University of Chicago Press. p. 54. ISBN 978-0226469065. ^ a b Althani, Mohamed (2013). Jassim the Leader: Founder of Qatar. Profile Books. p. 16. ISBN 978-1781250709. ^ Gillespie, Carol Ann (2002). Bahrain (Modern World Nations). Chelsea House Publications. p. 31. ISBN 978-0791067796. ^ Anscombe, Frederick (1997). The Ottoman Gulf: The Creation of Kuwait, Saudi Arabia, and Qatar. Columbia University Press. p. 12. ISBN 978-0231108393. ^ Potter, Lawrence (2010). The Persian Gulf in History. Palgrave Macmillan. p. 262. ISBN 978-0230612822. ^ a b Heard-Bey, Frauke (2008). From Tribe to State. The Transformation of Political Structure in Five States of the GCC. p. 39. ISBN 978-88-8311-602-5. ^ Crystal, Jill (1995). Oil and Politics in the Gulf: Rulers and Merchants in Kuwait and Qatar. Cambridge University Press. p. 27. ISBN 978-0521466356. ^ Casey, Michael S. (2007). The History of Kuwait (The Greenwood Histories of the Modern Nations). Greenwood. pp. 37–38. ISBN 978-0313340734. ^ a b "'Gazetteer of the Persian Gulf. Vol I. Historical. Part IA & IB. J G Lorimer. 1915'  (998/1782)". qdl.qa. Retrieved 13 January 2014. ^ "Qatar". Teachmideast.org. Retrieved 27 June 2013. ^ a b c Kursun, Zekeriya (2004). Katar'da Osmanlilar 1871–1916. Turk Tarih Kurumu. ^ a b Rogan, Eugene; Murphey, Rhoads; Masalha, Nur; Durac, Vincent; Hinnebusch, Raymond (November 1999). "Review of The Ottoman Gulf: The Creation of Kuwait, Saudi Arabia and Qatar by Frederick F. Anscombe; The Blood-Red Arab Flag: An Investigation into Qasimi Piracy, 1797–1820 by Charles E. Davies; The Politics of Regional Trade in Iraq, Arabia and the Gulf, 1745–1900 by Hala Fattah". British Journal of Middle Eastern Studies. 26 (2): 339–342. doi:10.1080/13530199908705688. JSTOR 195948. ^ "Battle of Al Wajbah". Qatar Visitor. 2 June 2007. Archived from the original on 17 January 2013. Retrieved 22 January 2013. ^ a b c "Amiri Diwan – Shaikh Abdullah Bin Jassim Al Thani". Diwan.gov.qa. Archived from the original on 10 February 2012. Retrieved 28 October 2012. ^ a b "New Qatari emir Sheikh Tamim 'set to announce reshuffle'". BBC News. 26 June 2013. Retrieved 26 June 2013. ^ "140th Assembly and related meetings". Inter-Parliamentary Union. 4 January 2018. Retrieved 31 March 2019. ^ "Qatar (01/10)". State.gov. Retrieved 28 March 2010. ^ Coman, Julian (21 March 2005). "Egyptian Suicide Bomber Blamed for Attack in Qatar". The Independent. ^ Analytica, Oxford (25 March 2005). "The Advent of Terrorism in Qatar". Forbes. ^ "Qatar Timeline". BBC News. 14 June 2012. Retrieved 7 January 2013. ^ Roula Khalaf & Abigail Fielding Smith (16 May 2013). "Qatar bankrolls Syrian revolt with cash and arms". Financial Times. Retrieved 3 June 2013. ^ Ahmed Rashid, Ahmed (4 October 2017). "Why closing the Taliban's Qatar office would be an erro". Financial Times. Retrieved 30 October 2017. ^ Nordland, Rod (24 June 2013). "In Surprise, Emir of Qatar Plans to Abdicate, Handing Power to Son". NYTimes.com. Retrieved 26 June 2013. ^ "The World factbook". CIA.Gov. 20 June 2014. Retrieved 20 June 2014. ^ "Saudi Arabia and Bahrain break diplomatic ties with Qatar over 'terrorism'". The Guardian. The Guardian. Retrieved 5 June 2017. ^ Paul Rhys in Doha. "Blatter reaches out to Arabia". Aljazeera.com. Retrieved 30 December 2013. ^ "BBC NEWS – Middle East – How democratic is the Middle East?". news.bbc.co.uk. Retrieved 5 June 2017. ^ a b c Lambert, Jennifer (2011). "Political Reform in Qatar: Participation, Legitimacy and Security". 19 (1). Middle East Policy Council. ^ "Qatar to hold advisory council elections in 2013". Reuters (UK edition). Reuters. 1 November 2011. Retrieved 4 March 2012. ^ "Qatari emir Sheikh Hamad hands power to son Tamim". BBC. 25 June 2013. Retrieved 25 June 2013. ^ a b "Council of Ministers". Embassy of the State of Qatar in Washington DC. Archived from the original on 12 June 2010. Retrieved 4 March 2012. ^ "Legislative elections in Qatar postponed until at least 2019". Doha News. 17 June 2016. Retrieved 26 May 2017. ^ "The People Want Reform… In Qatar, Too". Jadaliyya. ^ a b "The Permanent Constitution of the State of Qatar". Government of Qatar. Archived from the original on 6 October 2014. ^ a b "Constitution of Qatar". According to Article 1: Qatar is an independent Arab country. Islam is its religion and Sharia law is the main source of its legislation. ^ "The World Factbook". U.S. Central Intelligence Agency. ^ "Qatar" (PDF). US Department of State. ^ "Qatar Gender Equality Profile" (PDF). UNICEF. ^ a b "Amnesty International Annual Report 2012 – Qatar". Amnesty International. Retrieved 19 March 2014. ^ a b "Filipino woman gets 100 lashes for giving birth in Qatar". ^ "Annual Report". Amnesty International. 23 October 2014. ^ "Qatar sentences man to 40 lashes for drinking alcohol". Arabian Business. ^ "Qatar sentences man to lashes for drinking alcohol". Al Akhbar. ^ "Qatar court orders lashing of Muslim barber over drinking alcohol". Al Arabiya. ^ "Indian expat sentenced to 40 lashes in Qatar for drink-driving". Arabian Business. ^ "Special report: The punishment was death by stoning. The crime? Having a mobile phone". ^ a b Jenifer Fenton. "Religious law, prison for "blasphemy", severe sexual inequalilty: Qatar's human rights review". ^ "What are the worst countries in the world to be gay?". ^ Davies Krish (9 April 2019). "General Laws and Regulations in Qatar". OnlineQatar. ^ a b c d Alex Delmar-Morgan (7 January 2012). "Qatar, Unveiling Tensions, Suspends Sale of Alcohol". Wall Street Journal. Retrieved 17 January 2012. ^ a b c Jenifer Fenton (16 January 2012). "Qatar's Impromptu Alcohol Ban". The Arabist. Retrieved 17 January 2012. ^ "Qatar Distribution Company". Qatar Loving. ^ "Purchasing Alcohol in Qatar". Qatar Visitor. 2 June 2007. Archived from the original on 1 May 2011. Retrieved 1 May 2011. ^ Walid, Tamara (11 November 2009). "Qatar would 'welcome' Israel in 2022". The National. Retrieved 10 August 2013. ^ a b James M. Dorsey (17 January 2012). "Debate Questions Emir's Powers To Shape Qatar's Positioning As Sports Hub And Sponsor of Revolts – Analysis". The Eurasia Review. Retrieved 17 January 2012. ^ "Alcohol ban lifted for new hotel on The Pearl-Qatar". Arabian Business. Retrieved 19 June 2017. ^ Elgot, Jessica (28 May 2014). "'Leggings Are Not Pants' Qatar's New Modesty Campaign Aimed At Westerners'". Huffington Post. ^ Aningtias Jatmika (29 May 2014). "Qatar Bans Tourists from Wearing Leggings in Public". ^ a b c d "Country Narratives". Human Trafficking Report 2011. Office to Monitor and Combat Trafficking in Persons, United States Department of State. June 2011. Retrieved 21 January 2012. ^ Kelly, Tobias (2009). "The UN Committee against Torture: Human Rights Monitoring and the Legal Recognition of Cruelty". Human Rights Quarterly. 313 (3): 777–800. doi:10.1353/hrq.0.0094. ^ "Death penalties in the world -Qatar". 2014. ^ "International unions warn Qatar's work visa system allows employers to use forced labour". ITUC-CSI-IGB. ^ Owen Gibson (14 May 2014). "Qatar government admits almost 1,000 fatalities among migrants". ^ a b "Qatar to allow trade union, scrap 'sponsor' system". Al Arabiya. 1 May 2012. Archived from the original on 12 August 2014. Retrieved 12 March 2015. ^ Wilson, Nigel (21 July 2014). "Qatar Announces New Labour Law Reforms Amid Workers' Rights Outcry". International Business Times. Retrieved 12 March 2015. ^ Walker, Lesley (15 January 2015). "Firms in Qatar who fail to pay workers on time could face suspensions". Doha News. Retrieved 12 March 2015. ^ Peter Kovessy (27 October 2015). "Qatar's Emir signs into law kafala changes (updated)". Doha News. ^ "Qatar's inaction on labor reform a 'human rights disaster', Amnesty". RT. Russia Today. 1 December 2015. ^ "Qatar: New reforms Won't Protect Migrant Workers". Human Rights Watch. 8 November 2015. ^ Chris Arsenault (28 October 2015). "Qatar complicit in 'modern slavery' despite reforms – unions". Reuters. ^ Miles, Hugh (2005). Al-Jazeera. ^ a b Boghardt, Lori Plotkin (6 October 2014). "Qatar Is a U.S. Ally. They Also Knowingly Abet Terrorism. What's Going On?". New Republic. Retrieved 7 October 2014. Two overarching goals have driven Qatari policy. One has been to maximize Qatar's influence on the regional and international stage. This originally reflected the personal ambition of the former ruler and current emir's father, Shaykh Hamad bin Khalifa al Thani, and his foreign minister and eventual prime minister, Shaykh Hamad bin Jassim al Thani. The two men directed foreign policy until the father abdicated in favor of his son, Emir Tamim bin Hamad al Thani, in July 2013. The second objective has been to preserve the security of the ruling family and state. ^ H Rahman (2005). The Emergence of Qatar. Routledge. ISBN 978-0-7103-1213-6. Retrieved 26 June 2013. ^ "'Qatar, China enjoy strong ties based on respect'". Gulf-Times (in Arabic). 11 July 2018. ^ "Commentary: Isolated Qatar pivots towards China, as its ties with Gulf states wane". Channel NewsAsia. ^ "Qatar relies on US base amid Gulf tensions". FT.com. Retrieved 16 June 2013. ^ Zacharia, Janine (4 March 2008). "For Qatar, relations with West are a balancing act". New York Times. Retrieved 30 January 2011. ^ a b c d Mark Mazzetti; C.J. Chivers; Eric Schmitt (30 June 2013). "Taking Outsize Role in Syria, Qatar Funnels Arms to Rebels". New York Times. Retrieved 21 January 2014. ^ "Qatar and Saudi Arabia sign defense agreement". Tehrantimes.com. 25 February 2010. Retrieved 2 October 2010. ^ "Qatar recognizes Libyan rebels after oil deal". Al Jazeera. 28 March 2011. Retrieved 29 March 2011. ^ Kirkpatrick, David D. (7 September 2014). "Qatar's Support of Islamists Alienates Allies Near and Far". The New York Times. Retrieved 5 June 2015. ^ Islam Hassan (31 March 2015). "GCC's 2014 Crisis: Causes, Issues and Solutions". Al Jazeera Research Center. Retrieved 4 June 2015. ^ Norton, Ben (28 June 2016). "CIA and Saudi weapons for Syrian rebels fueled black market arms trafficking, report says". Salon.com. Archived from the original on 27 September 2016. ^ a b John Defterios (27 October 2014). CNN "ISIS: Can coalition cut off funding of world's wealthiest terror group?". ^ "'Army of Conquest' rebel alliance pressures Syria regime". Yahoo News. 28 April 2015. ^ "Gulf allies and 'Army of Conquest'". Al-Ahram Weekly. 28 May 2015. ^ Kim Sengupta (12 May 2015). "Turkey and Saudi Arabia alarm the West by backing Islamist extremists the Americans had bombed in Syria". The Independent. ^ The Daily Beast. "Qatar Sends Aid Money to Help Egypt". TheDailyBeast.com. Retrieved 4 November 2013. ^ "The Al-Jazeera Effect". Foreign Policy. 9 February 2011. ^ Reuters. "Egypt Returns $2 Billion to Qatar in Sign of Growing Tensions". Voanews.com. Retrieved 30 December 2013. ^ "Gaza conflict spotlights role of Qatar, the Hamas-funding U.S. ally". 28 July 2014. Retrieved 30 July 2014. ^ "Al Attiyah to CNN: Israel doesn't want peace". 28 July 2014. Retrieved 26 October 2014. ^ "Qatar pledges $1 billion for Gaza rebuilding at Cairo conference". 12 October 2014. Retrieved 26 October 2014. ^ "Enriching the Middle East's Economic Future Conferences". Qatar Conferences. Retrieved 12 March 2015. ^ "Sudan Minister Lauds Doha Declaration For Initiating Darfur Peace Process". Qatar Chronicle. 9 June 2013. Retrieved 22 June 2013. ^ "Qatar donates $88.5 Million for Darfur". 24 September 2014. Retrieved 21 September 2014. ^ "Six nations cut diplomatic ties to Qatar as Arab rift deepens". Hurriyet Daily News. 5 June 2017. ^ a b "Saudi Arabia, UAE, Egypt and Bahrain break diplomatic ties with Qatar over 'terrorism'". The Guardian. 5 June 2017. ^ "Yemen cuts diplomatic ties with Qatar: state news agency". reuters. 5 June 2017. ^ "To 'make Qatar an island' Saudi Arabia plans to dig canal along border: Report | Free Press Kashmir". freepresskashmir.com. Retrieved 20 June 2018. ^ "Saudi Arabia to turn Qatar into an island by digging massive canal – report". RT International. Retrieved 20 June 2018. ^ Chief, Habib Toumi, Bureau (19 June 2018). "Saudi Arabia moves ahead with Salwa canal plan". GulfNews. Retrieved 20 June 2018. ^ "Saudi Arabia sets bidding deadline for Salwa Canal that will make Qatar island". DailySabah. Retrieved 20 June 2018. ^ "Saudi Arabia is building a canal to turn Qatar into an island". AMN - Al-Masdar News | المصدر نيوز. 20 June 2018. Retrieved 20 June 2018. ^ "Military expenditure by country as percentage of gross domestic product, 2003–2016" (PDF). SIPRI. ^ "The SIPRI Military Expenditure Database". Stockholm International Peace Research Institute. Archived from the original on 28 March 2010. Retrieved 29 October 2011. ^ a b c d e "The Strange Power of Qatar by Hugh Eakin". The New York Review of Books. Retrieved 16 June 2013. ^ "Trends in International Arms Transfer, 2014". www.sipri.org. Stockholm International Peace Research Institute. Archived from the original on 19 March 2015. Retrieved 18 March 2015. ^ "TIV of arms imports to the top 50 largest importers, 2016-2016". SIPRI. ^ "Saudi Arabia uses terrorism as an excuse for human rights abuses". Al Jazeera America. 3 December 2015. ^ "Yemen crisis: Who is fighting whom?". 28 March 2017. Retrieved 5 June 2017 – via www.bbc.com. ^ "Airstrike Hits Doctors Without Borders Hospital in Yemen". Retrieved 5 June 2017. ^ "Yemen conflict: MSF hospital destroyed by air strikes". 27 October 2015. Retrieved 5 June 2017 – via www.bbc.com. ^ "Qatar Municipalities". Qatar Ministry of Municipality and Environment. Retrieved 8 August 2017. ^ "2015 Population census" (PDF). Ministry of Development Planning and Statistics. April 2015. Retrieved 8 August 2017. ^ "Population By Gender, Municipality And Zone, March 2004". General Secretariat for Development Planning. Archived from the original on 12 December 2006. ^ "List of Parties". Convention on Biological Diversity. Retrieved 8 December 2012. ^ "National Biodiversity Strategy and Action Plan. State of Qatar" (PDF). Convention on Biological Diversity. Retrieved 9 December 2012. ^ A. H. Moubasher (1993). Soil Fungi in Qatar and Other Arab Countries. Centre for Scientific and Applied Research, University of Qatar. p. i–xvi, 570 pp., 86 plates. ISBN 978-99921-21-02-3. ^ "CO2 emissions (metric tons per capita)". Data.worldbank.org. Retrieved 7 January 2013. ^ Pearce, Fred (14 January 2010). "Qatar to use biofuels? What about the country's energy consumption?". The Guardian. London. ^ a b "Qatar National Vision 2030". Ministry of Development Planning and Statistics. Archived from the original on 13 November 2012. ^ Rasoul Sorkhabi (2010). "The Qatar Oil Discoveries". GEO ExPro Magazine. 7 (1). ^ Nordland, Rod (25 June 2013). "New Hope for Democracy in a Dynastic Land". NYTimes.com. Retrieved 26 June 2013. ^ "Report for Selected Countries and Subjects (PPP valuation of country GDP)". IMF. October 2016. ^ Bill Crane (20 April 2015). Gravediggers of the Gulf. Jacobin. Retrieved 20 April 2015. ^ "Qatar: Migrant Construction Workers Face Abuse". Human Rights Watch. ^ Robert Tuttle (22 May 2014). World Cup Host Qatar Ranked Among Worst Places to Work by Unions. Bloomberg. Retrieved 29 July 2014. ^ "Qatar tourist guide". Retrieved 14 February 2012. ^ "Doing Business in Qatar: 2012 Country Commercial Guide for U.S. Companies" (PDF). US & Foreign Commercial Service And US Department of State. Archived from the original (PDF) on 16 January 2013. Retrieved 7 January 2013. ^ "OPEC Member Countries". Organization of Petroleum Exporting Countries. Retrieved 20 January 2019. ^ "The World's Richest Countries". Forbes. ^ Kortekaas, Vanessa (28 October 2013). "New Qatar emir shakes up sovereign wealth fund". Financial Times. Retrieved 30 December 2013. ^ "Qatar Holding LLC Among Investors in BlackBerrys $1 Billion Convertible Debt". Berryreview.com. 6 November 2013. Retrieved 30 December 2013. ^ Hall, Camilla (30 October 2013). "Qatar fund quietly builds $1bn Bank of America stake". Financial Times. Retrieved 30 December 2013. ^ Hall, Camilla (4 July 2013). "Qatar: what's next for the world's most aggressive deal hunter?". Financial Times. Retrieved 30 December 2013. ^ "Taxes on junk food, luxury items to be rolled out in Qatar soon". 16 February 2017. Retrieved 5 June 2017. ^ "layoffs Archives – Doha News". Doha News. Retrieved 5 June 2017. ^ a b c Simon Lincoln Reader (12 November 2013). "Qatar shows how money can solve most problems". Bdlive.co.za. Retrieved 30 December 2013. ^ Cite error: The named reference dn1 was invoked but never defined (see the help page). ^ "Qatar's emir officially inaugurates Hamad Port". Al Jazeera. 5 September 2017. Retrieved 5 September 2017. ^ John Davison (15 June 2017). "Gulf crisis a "blessing in disguise" for Qatar seaport". Reuters. Retrieved 23 July 2017. ^ "Qatar strengthens port facilities, capacity and transport links". Oxford Business Group. 2016. Retrieved 6 October 2018. ^ "Population structure". Qatar Statistics Authority. 31 January 2013. Archived from the original on 18 May 2013. ^ "History of Census in Qatar". Qatar Statistics Authority. Archived from the original on 20 April 2010. Retrieved 16 June 2013. ^ "Qatar's delicate balancing act". BBC News. 16 January 2013. Retrieved 23 May 2013. ^ Pandit, Mobin (5 January 2013). "Population rise will push up rents". The Peninsula Qatar. Archived from the original on 29 October 2013. ^ Kovessy, Peter. "Though many leave Qatar, there are more people here than ever". DohaNews.Co. Doha News. Retrieved 17 January 2016. ^ "Tiny Qatar's growing global clout". BBC. 30 April 2011. Retrieved 12 March 2015. ^ "Qatar's modern future rubs up against conservative traditions". Reuters. 27 September 2012. ^ "Rising power Qatar stirs unease among some Mideast neighbors". Reuters. 12 February 2013. Retrieved 13 June 2013. ^ "2011 Report on International Religious Freedom – Qatar". US Department of State. ^ "Religious Composition by Country" (PDF). Global Religious Landscape. Pew Forum. Archived from the original (PDF) on 9 March 2013. Retrieved 9 July 2013. ^ "Christians to Welcome Qatar's First Christian Church". Christianpost.com. 24 February 2008. Retrieved 22 January 2013. ^ "CIA The World Fact Book". State.gov. 29 June 2006. Retrieved 28 March 2010. ^ a b "Report on Qatar". Cumorah Project. Retrieved 12 March 2015. ^ a b "The Anglican Centre in Qatar". Epiphany-qatar.org. Archived from the original on 16 January 2013. Retrieved 22 January 2013. ^ a b David B. Barrett; George Thomas Kurian; Todd M. Johnson (2001). World Christian encyclopedia: a comparative survey of churches and religions in the modern world. 1. Oxford University Press. p. 617. ISBN 978-0-19-510318-2. ^ Guttenplan, D. D. (11 June 2012). "Battling to Preserve Arabic From English's Onslaught". The New York Times. Retrieved 24 November 2013. ^ Tweedie, Gregory; Johnson, Robert. "Listening instruction and patient safety: Exploring medical English as a lingua franca (MELF) for nursing education". Retrieved 6 January 2018. ^ "Qatar Facts". First Qatar Orthodontic Conference. Archived from the original on 12 July 2014. Retrieved 23 January 2013. ^ Jacot, Martine (23 December 2013). "Le Qatar ne paie pas ses contributions à la francophonie". Retrieved 5 June 2017 – via Le Monde. ^ "Clément Duhaime : "Le Qatar n'a pas tenu ses promesses" à l'OIF - JeuneAfrique.com". 22 April 2015. Retrieved 5 June 2017. ^ Kamrava, Mehran (2013). Qatar: Small State, Big Politics. Cornell University Press. ISBN 978-0801452093. ^ "Qatar National Day 2011". Time Out Doha. 29 November 2011. Retrieved 12 March 2015. ^ "Everything you need to know about Qatar National Day 2012". Doha News. 10 December 2012. Retrieved 18 February 2015. ^ "Art in Qatar: A Smithsonian in the sand". The Economist. 1 January 2011. Retrieved 16 June 2013. ^ "QMA Board of Trustees". Qatar Museums Authority. Archived from the original on 2 April 2015. Retrieved 12 March 2015. ^ "Qatar revealed as the world's biggest contemporary art buyer". The Art Newspaper. Retrieved 16 June 2013. ^ Bohas, Alexander. "The Political Trump-Cards of Cultural Potency Qatar's Policy of 'Cultural Grandeur'". Chaos International. Retrieved 13 April 2013. ^ Shabina S. Khatri (6 July 2014). "Qatar's National Museum eyeing 2016 opening". Doha News. Retrieved 2 June 2015. ^ "Qatar's national museum by Jean Nouvel opening date announced". Gulf Times Qatar. 4 November 2018. Retrieved 4 November 2018. ^ a b Hassan Tawfiq (1 May 2015). "الشعر في قطر علي امتداد مائة سنة" (in Arabic). Al Jasra Cultural and Social Club. Retrieved 29 August 2018. ^ a b "Qatar Freedom of the Press". Freedom House. Retrieved 19 January 2015. ^ Barrie Gunter; Roger Dickinson (6 June 2013). News Media in the Arab World: A Study of 10 Arab and Muslim Countries. A&C Black. p. 33. ISBN 1-4411-0239-6. Retrieved 8 February 2014. ^ Blanchard, Christoper (2014). Qatar: Background and U.S. Relations. Congressional Research Service. p. 17. ISBN 9781437987089. ^ Roth, Richard J. (8 May 2013). "Awaiting a Modern Press Law in Qatar". New York Times. Retrieved 16 June 2013. ^ "New cybercrime law could have serious consequences for press freedom in Qatar". cpj.org. 27 September 2014. Retrieved 19 January 2015. ^ "Qatar: New Cyber Crime Law poses real threat to Freedom of Expression". gc4hr.org. 17 September 2014. Retrieved 19 January 2015. ^ The Report: Qatar 2010. Oxford Business Group. 2010. p. 237. ISBN 9781907065446. ^ "NRI Overall Ranking 2014" (PDF). World Economic Forum. Retrieved 28 June 2014. ^ a b "Arts and Culture". Embassy of Qatar in London. Retrieved 25 June 2015. ^ "Heritage and Culture". Qatar e-Gov. Retrieved 26 April 2015. ^ "Qatar – a Sporting Nation". Qatar e-Government. Retrieved 12 March 2015. ^ Gibbes, Martin; Schiller, Emma (4 January 2011). "Fox Sports brings you everything you need to know – and a few things you don't – about the Asian Cup". Fox Sports. Retrieved 12 March 2015. ^ "Qatar stun Japan with 3-1 win to be crowned Asian Cup champions". Guardian. 1 February 2019. Retrieved 5 February 2019. ^ Paul Radford (2 December 2010). "Russia, Qatar win 2018 and 2022 World Cups". Reuters. Retrieved 2 December 2010. ^ "Europe's Top Leagues protest against 2022 winter World Cup in Qatar". Qatar Chronicle. 12 August 2013. Archived from the original on 17 August 2013. Retrieved 21 August 2013. ^ "Fifa wants Qatar 2022 postponed to Winter". Qatar Chronicle. 20 July 2013. Archived from the original on 10 November 2014. Retrieved 21 August 2013. ^ "BBC Sport – Qatar World Cup: '£3m payments to officials' corruption claim". Bbc.co.uk. Retrieved 1 June 2014. ^ "World Cup inquiry clears Qatar but criticises English FA". BBC. 13 November 2014. Retrieved 12 March 2015. ^ Pattisson, Pete (25 September 2013). "Revealed: Qatar's World Cup 'slaves'". The Guardian. Retrieved 26 September 2013. So entrenched is this exploitation that the Nepalese ambassador to Qatar, Maya Kumari Sharma, recently described the emirate as an "open jail". ^ Booth, Robert; Pattisson, Pete (28 July 2014). "Qatar World Cup: migrants wait a year to be paid for building offices". The Guardian. Retrieved 12 March 2015. ^ Owen Gibson and Pete Pattisson (23 December 2014). Death toll among Qatar's 2022 World Cup workers revealed. The Guardian. Retrieved 29 May 2015. ^ Gibson, Owen (14 June 2014). "Qatar hits back at allegations of bribery over 2022 World Cup". The Guardian. Retrieved 12 March 2015. ^ "Match report" (PDF). International Handball Federation. Retrieved 12 March 2015. ^ "2014 FIBA 3x3 World Championships". International Basketball Federation. Archived from the original on 31 October 2015. Retrieved 13 November 2015. ^ "The homepage of Tour of Qatar". Letour.fr. 1 December 1994. Archived from the original on 16 January 2013. Retrieved 22 January 2013. ^ Gay, Chris. "Skydive Mag – Incredible Demo at Doha". Retrieved 5 June 2017. ^ "QVA – Qatar Volleyball Association". QVA. Retrieved 5 June 2017. ^ Anderson, Nick (6 December 2015). "The Education City contracts: A case study from VCU in Qatar". Washington Post. Retrieved 14 March 2018. ^ "In the occasion of Literacy Arab Day, Qatar has the Lowest Illiteracy Rates in 2012". Qatar Statistics Authority. 8 January 2013. ^ "Qatar constitution". Archived from the original on 18 September 2013. ^ "Our history". Qatar University. Retrieved 12 March 2015. ^ Hendengren, Adam (25 June 2013). "SPECIAL REPORT: UNIVERSITY STUDIES IN THE MIDDLE EAST". Your Middle East. Retrieved 12 June 2015. ^ "World Data on Education – Qatar" (PDF). UNESCO. Retrieved 21 July 2015. ^ Anderson, Margery K.; Tarfa Nasser Alnaimi; Shaikha Hamad Alhajri (1 November 2010). "National student research fairs as evidence for progress in Qatar's Education for a New Era". Improving Schools. 13 (3): 235–248. doi:10.1177/1365480210390083. ^ "Education for a New Era". Supreme Education Council. Archived from the original on 13 September 2005. Retrieved 25 March 2008. ^ "Qatar". Ranking Web of Universities. Retrieved 26 February 2013. ^ "Stenden University Qatar". Archived from the original on 16 May 2009. Retrieved 22 May 2009. ^ PISA 2012 Results in Focus. OECD. 2014. p. 5. ^ "Key findings – Organisation for Economic Co-operation and Development". Oecd.org. Retrieved 30 December 2013. ^ "Welcome to Al-Bairaq World". Qu.edu.qa. 6 March 2014. Archived from the original on 19 April 2014. Retrieved 14 July 2014. Amiri Diwan (official government website). "Qatar". The World Factbook. Central Intelligence Agency. Qatar from the BBC News. Key Development Forecasts for Qatar from International Futures. Legal Portal by the Ministry of Justice, including official gazette.